Beginning Wednesday June 27, Metrograph will present a 8-film retrospective of Gus Van Sant, and a sneak preview of his newest work, Don’t Worry, He Won’t Get Far on Foot. By turns a determined outsider artist and an insider Hollywood player, equally effective when operating as an austere, experimentally-oriented formalist and as a traditional narrative director of unusual emotional directness and potency, Van Sant has produced one of the most diverse, unexpected, and consistently inspired bodies of work in recent American cinema. After establishing himself through films telling stories from the fringes of drug dependency and queer culture, Van Sant catapulted to extraordinary popular success on the back of the phenomenon that was Good Will Hunting, a breakthrough that he would shortly follow with the perverse experiment of his shot-by-shot Psycho remake and a run of oblique, willfully difficult, and troublingly beautiful films running from Gerry to Paranoid Park. Now, on the occasion of the forthcoming release of Van Sant’s Don’t Worry, He Won’t Get Far on Foot, based on the memoir of quadriplegic Portland cartoonist Bill Callahan, Metrograph presents a giddy look back at this career of dizzying twists and hairpin turns, always headed for the next bend in the road. Van Sant, a longtime Portlander and steadfast Northwest regionalist, sets out in his latest to tell the story of a local legend, the late quadriplegic cartoonist John Callahan, whose memoir was originally brought to the director’s attention by Robin Williams. Joaquin Phoenix, cementing his status as his generation’s greatest actor and shapeshifter, plays the hell-raising, provocatively un-P.C. Callahan, a wheelchair-bound speed demon clawing his way out of the hell of alcoholism with the help of life coach and sponsor Donny—an unrecognizable, and exceptional, Jonah Hill. A return to the tender, intimate filmmaking of Good Will Hunting, and an exciting new chapter in the ongoing, open-ended adventure of Van Sant’s career. Through the character of Nicole Kidman’s manipulative, celebrity-fixated meteorologist, Van Sant creates a queasily perspicacious study of the American obsession with fame in this mockumentary loosely based on the true crime case of Pamela Smart, lent satirical sting by screenwriter Buck Henry (The Graduate), and the peak performances by Matt Dillon and a young Joaquin Phoenix, respectively playing Kidman’s oblivious husband and teenaged lover-turned-stooge. The movie that launched Van Sant into mainstream attention was, paradoxically, a snapshot of life on the edge, featuring Matt Dillon, Kelly Lynch, and Max Perlich, as a small posse of fellow addicts traveling across the c. 1971 Pacific Northwest, feeding their habits by conning and cadging from every pharmacy they encounter along the way. A gritty insider’s look at the crucible of addiction and recovery from James Fogle’s autobiographical novel, featuring a grave performance by the patron saint of junkie-dom, William S. Burroughs. Van Sant’s follow-up to Drugstore Cowboy is another road movie on the skids. 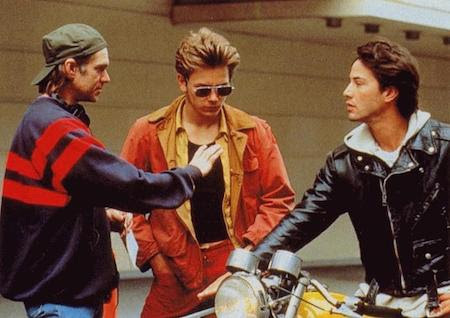 This time the footloose bums are a narcoleptic queer hustler, Mike (River Phoenix), and the slumming scion of a wealthy family, Scott (Keanu Reeves), who looks after Mike, and takes him on a quest for his mother… until the time comes to put aside childish things. A Pacific Northwestern retelling of Shakespeare’s Falstaff-Hal bromance, Idaho was a film lushly romantic enough to launch many a young viewer into self-discovery. Without doubt one of the boldest formal gambits to appear at American multiplexes in ages, Van Sant cashed in on his Good Will Hunting triumph by making this “shot-by-shot” remake of Alfred Hitchcock’s 1960 masterwork, updated to a late 90s setting, with subtle deviations from the original permitted by new camera technology and relaxed censorship, and with the nonpareil Christopher Doyle shooting in lush, saturated color in place of the original black-and-white cinematography. Not intended as a replacement for the original, but works as a fascinating investigation into what makes a classic tick. Two men, both named Gerry, drive off towards the desert, pull over, then wander into the wastes with no firm destination and, finally, no direction home. The beginning of a radical, noncommercial new direction in Van Sant’s work, here heavily influenced by the durational cinema of Béla Tarr, this minimalist marvel of languorous long takes slows down to enlarge every nuance of the performances by stars Matt Damon and Casey Affleck, and to allow the eye to drift into the desert panoramas. A film about getting lost, into which the viewer can themselves disappear. A meditative eulogy for another of Van Sant’s beautiful lost boys, this one isolated by fame in the apotheosis of his largely solitary final hours. Michael Pitt plays “Blake”—a facsimile of Kurt Cobain in everything but name—escaped from rehab to wander the grounds of his compound/ flophouse in an opioid haze, taking calls, recording music, desultorily interacting with his roommates, and meandering towards eternity. A hypnotic and strangely sensual film attuned to the minutiae of addict behavior, lent an autumnal ripeness by DP Harris Savides and made with the solemnity of religious art.